Sophie is oh so sophisticated. Her shiny pink Gerberas are complemented by mixed Carnations, with their fresh sweet smell, and green Chrysanthemums, to make an unforgettable arrangement that is sure to bring a smile to your special someone. Vase not included. We would however suggest including a Premium Vase with your gift to make the Sophie that much more impressive. Seamless ordering and delivery to my loved one, would definitely be back! I found your website easy to manuvure as I had tried two other flower websites and they were just too hard. So thank you. Very user friendly website. Same day delivery. 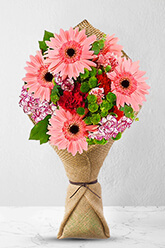 Beautiful flowers and great email communication. I did not see the flowers but my sister in law rang to say how beautiful they were.. Thank you. The flowers were delivered promptly. The only reason I've not given excellent is that I've not seen the quality of the flowers. The website is user friendly. Ordering was easy, good range of price options, will definitely order with you again!